EXTENDED TAYLOR RELATIONSHIP BASED ON THE ROLE OF THE NATURAL TOOL-CHIP CONTACT LENGTH HAS BEEN DEVELOPED. EXPERIMENTAL WORK FOR THE VERIFICATION OF THE VALIDITY OF THIS RELATIONSHIP HAS BEEN CARRIED OUT FOR DIFFERENT CUTTING CONDITIONS, USING SS 2940 WORKPIECE MATERIAL AND DIFFERENT TOOL/COATING MATERIALS (UNCOATED, TiN, Ti(C,N) AND (A1sub2 0sub3). 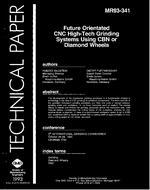 THE TEST RESULTS SHOW THE EXTENDED TAYLOR RELATIONSHIP GIVES AN ADEQUATE ESTIMATE OF THE MACHINABILITY SUBSTANTIAL REDUCTION IN THE USE OF RESOURCES IN MACHINABILITY TESTING, AND AN ACCURATE BASES FOR THE DETERMINATION OF TOOL LIFE OR THE MOST ECONOMICAL CONDITIONS FOR THE MACHINING OF A GIVEN LOT.